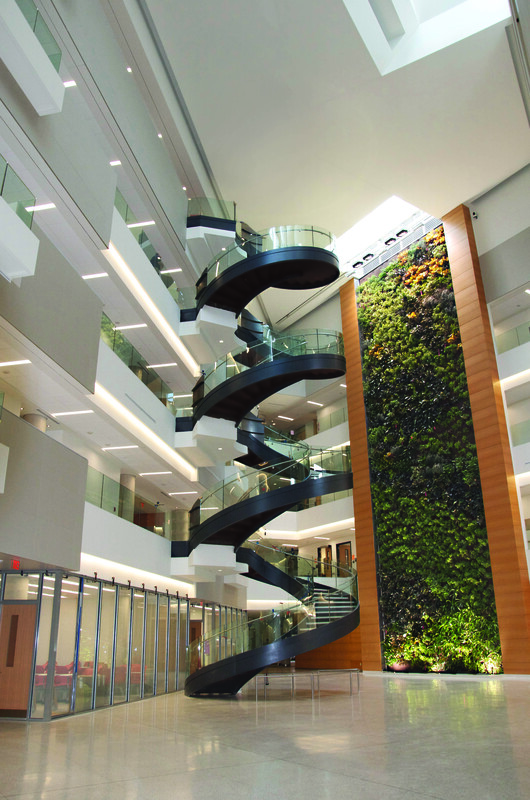 When I first heard about the 5-story biowall at Drexel University I was impressed. I’d often heard that plants help clean indoor air and it seemed that having a large experimental setup like this would be great. Just to briefly summarize, this wall features 12 kinds of plants, all growing hydroponically on a giant mesh. Proponents of biowalls claim that they reduce the concentration of volatile organic compounds (VOCs) such as fun things like benzene, formaldehyde, and toluene. The best part of course is that this is thought to be mediated by microbes which are associated with the plants. However, I remembered hearing a building scientist recently complain about the lack of evidence that plants actually did anything significant to VOC concentrations indoors. So I sent him the link above and in return got a whole bunch of information about this topic, including this, this, and this. Turns out, the picture isn’t at all as clear cut as it might appear. There have never been any (completed) large field studies looking at the effects of plants on VOCs and a review of smaller field studies found no significant effect. The one study everyone talks about was conducted by NASA in 1989 in a sealed chamber. While this work did find a reduction in VOCs it had some significant issues. Some work has shown that blowing air with a fan over soil or adding activated charcoal to the soil causes similar reductions in VOCs (suggesting the importance of the microbial contribution versus the plants). Other work has suggested it is the growing medium itself, not even microbes in the root zone. This raises the interesting question of whether a hydroponic system would work at all. Then to get back to the biowall. The researchers at Drexel have hypothesized that VOCs will get trapped in the water as air is forced through the biowall, to then be degraded by microbes. However, while some VOCs are in fact water-soluble (like formaldehyde) many are more hazardous to humans by the very virtue of not being water-soluble. The biowall is sill a valuable project if it attempts to actually address some of these concerns and takes into account how little is known about what the effects (if any) that plants have on VOC concentrations in the real world. And it does look cool. Pingback: A “living wall” with some science behind it? – microBEnet: the microbiology of the Built Environment network.